Kiwi, sugar, citric acid, sulfur dioxide. May contain traces of SULPHITES. Furred bowl, with a fruity soft core. The delicious and healthy fruit enjoys great popularity around the globe. No wonder - alone with her bright green flesh ensures the Kiwi in a jiffy good mood. 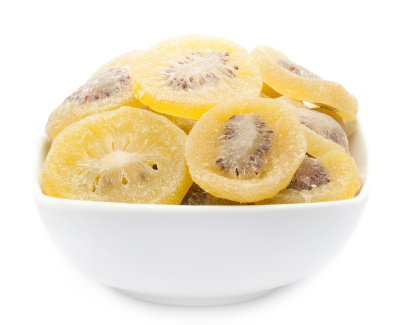 It is considered a vitamin C-bomb and strengthens to a delicious way the immune system. It owes its name the way the small Kiwi cute flightless bird, the New Zealand's national symbol, called kiwi bird. The candied sliced kiwi radiate the same goodwell being of how their fresh counterpart - only that you not get sticky hands for the enjoyment of our sweet delight. Around 40 years ago, the kiwi fruit was in this country completely unknown. But no sooner arrived in the stalls, the prickly fruit catapulted the popularity scale to the very top. The sliced kiwi will shoot immediately in the middle of your taste buds. The dried fruit slices are gently candied and reserve due to the careful processing their beautiful green colour that especially characterizes the Kiwi. It is an amusing snack that already catches your eye at first sight. Unusual, but charming. The sliced kiwi is a very unusual snack, knowing them as a fruit that you cut into the middle and then gently separates the meat out with a spoon. Another way is to get rid of their furry sheath then slice it to enjoy. Also, we have chosen the disc version with sliced kiwi, so you can admire the beautiful green of kiwi. The individual disks invite you to dreamy snacking, piece by piece pure sensuality and fruity pleasure. Enjoy it, cut into strips in your cereals or with a little Greek yoghurt.